On June 16, 2011, the State Water Resources Control Board (SWRCB) will consider whether to grant to El Sur Ranch all or part of its application for a water right permit. James Hill, owner of El Sur Ranch, will present evidence from biologic and hydrologic research gleaned over 20 years of studies by respected scientists and independent consultants regarding the ranch's water use and the lack of adverse impact to the lower Big Sur River's ecology, including, specifically, the effects on steelhead trout populations. This testimony will be complemented by supporting statements from local interests, including Big Sur residents, business owners and local officials. Established in 1834, El Sur Ranch is one of the last remaining California coastal ranches, contributing to the dramatic Big Sur coastline and opening unobstructed views of the ocean to travelers along Highway One. A vestige of California's ranchero legacy, El Sur Ranch defines heritage and cultural conservation by preserving Big Sur's natural scenic beauty as a secluded, rural landscape not spoiled by development. Even a detail as simple as its use of handmade, ranch-recycled fence posts reminds us of a time when California was the Wild West with open pastures and rolling farmland and when hard work promised the American Dream. 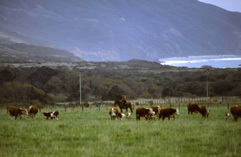 To preserve California's legacy of coastal ranches and ensure the continued beauty the pastures and cattle bring to the famous Highway One drive, El Sur Ranch must continue to irrigate its grazing fields, as it has done for over half a century. The Hill family has made a commitment to El Sur Ranch since its purchase in 1955. Their love of the land is obvious to all who travel Highway One or the Old Coast Road. There are no mansions, no hotels, no golf courses and no paved parking lots on the El Sur Ranch. Instead, set among rolling pastureland, remain preserved homes and barns of the ranch's original settlers. These pioneers, seeking their American Dream, had to bring supplies to El Sur Ranch by boat, unloading their wares on the beach while navigating dangerous tides and rough waters. 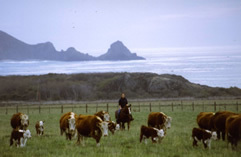 The determination and passion that drove early settlers to Big Sur, despite its rugged terrain, is the same motivating spirit to which this era's stewards of El Sur Ranch adhere - conserving the land and preserving the traditions of one of the few remaining California coastal working cattle ranches. 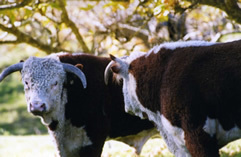 The El Sur Ranch owners have always emphasized conservation on their ranch, exemplified by the livestock they raise - grass-fed, healthy cows. The ranch also grants access to ranchland for educators, government agencies and scientists. El Sur Ranch works with the Ventana Wilderness Society to facilitate the protection, care and observation of the California Condor, an endangered species. El Sur Ranch provides both food and feeding grounds for this rare bird. El Sur Ranch has pumped groundwater from a well near the Big Sur River since about 1950. The first ranch well was drilled in 1949. Then two wells were drilled to supply the Point Sur Naval Facility in 1958 and 1968, respectively. All the wells were located on 15 acres of El Sur Ranch land that Cortlandt T. Hill donated to the Department of Parks and Recreation (DPR) in 1971 for an addition to Andrew Molera State Park. The 1971 gift deed to DPR generically reserved to the ranch the right to continue its existing cattle operation, implicitly including the right to continue to irrigate its pastures. In 1972, in accordance with the ranch's reservation of rights in the 15 acre gift parcel, DPR granted the ranch a use permit to drill five additional wells to serve the ranch, the U.S. Naval Facility at Point Sur and Andrew Molera State Park. The ranch drilled all of these wells with written DPR authorization and with DPR acting as the lead agency for compliance with environmental quality laws. Of the five new wells authorized by DPR, only two were for the ranch. One of these wells eventually became the ranch's “New Well" and the other was capped due to low yield. Of the other three new wells, one new well became the well for Molera Park headquarters, and two new wells were for the U.S. Naval Facility. The Navy decided not to put the last two wells into production. All of these wells were drilled in the same water-bearing deposits near the river within the 15 acres the ranch gifted to DPR. Although the ranch's reservation of rights in the land it gifted to DPR in 1971 implicitly included the right to continue to operate the ranch wells, in order to eliminate any ambiguity, a corrected gift deed was delivered to and accepted by DPR in 1975. In the corrected gift deed, the ranch specifically reserved the right to operate its existing El Sur Ranch wells within the 15-acre gift parcel and to apply the well water for agricultural purposes on the ranch. At that time in 1975, there were two existing ranch wells, the "Old Well" and the “New Well." "Construction began in the middle of July, 1990. A condition of the DFG 1601 (reference to the permit) was the diversion of the river around the project site. This involved the construction of a 250-foot channel where the floodplain meets the terrace known as Creamery Meadow. Once in the diversion channel, the river immediately disappeared into its gravels… The downstream reach, a long, straight riffle-run, remained dry for the rest of the project. There were diurnal fluctuations in the length of the dry reach, but it averaged about 600 feet." "The in stream work was performed in the summer of 1990, a critically dry year. When the river was moved into a temporary diversion channel the stream dried up subjecting us to public criticism. We think that the river would have stopped flowing at about the same time but since we were working in the river it didn't look good for us. We filed a water rights complaint stating our belief that the real reason the river dried up was the excessive underflow was being withdrawn to irrigate an adjacent pasture." To test DPR's allegation that it was irrigation pumping, rather than DPR's diversion project, which caused the river to dry up, El Sur Ranch stopped all pumping for 10 days. However, the flow of water did not resume. Independent investigations under the authority of the SWRCB revealed that El Sur Ranch pumping was likely not the cause of the de-watering of the river. Thorough studies in ensuing years refuted the DPR reports by confirming that El Sur Ranch pumping physically could not have been the cause. In fact, the river dried up due to the heavy excavation in the riverbed conducted by DPR. In response to the DPR complaint in 1990, the SWRCB staff made a preliminary determination that the ranch wells (and thus by necessity the adjoining wells of the Navy and DPR) were pumping river "subterranean streamflow," which is technically different from normal groundwater. Prior to this, from 1949 until the preliminary staff determination in 1990, it was believed – and presumed as a matter of law – that the water El Sur Ranch, DPR and the U.S. Navy were pumping was groundwater not subject to the jurisdiction of SWRCB. The pumping of subterranean streamflow requires a permit from the SWRCB. El Sur Ranch immediately applied for the permit, and SWRCB has allowed the ranch to continue pumping water throughout the application process. El Sur Ranch has limited its pumping to no more than 3.5 acre-feet per acre, consistent with a proposal by SWRCB. "In August 1990 State Parks submitted a complaint to the State Board regarding the pumping of Big Sur River underflow by Mr. Hill. In the summer of 1990 about 3,000 lineal feet of the lower Big Sur River went dry. The summer of 1990 was a critically dry drought period in the Big Sur area. We believe that Mr. Hill's continued pumping during this dry period caused the elimination of all surface flow in the river. During other dry years, including 1994, the river flow is low but continues to the river mouth lagoon. The low flows may be insufficient to provide optimum habitat for Steelhead and other aquatic organisms in the lower river and lagoon and to sustain the riparian habitat." DPR's protest did not inform the SWRCB of DPR ‘s streambed work, or that the stream dried up when DPR moved the river into a temporary diversion channel. The owners of El Sur Ranch donated land with wells to the State for an addition to Andrew Molera State Park, reserving the right to continue to operate El Sur Ranch wells and use water for their on-going agricultural operation. In compliance with the California Environmental Quality Act (CEQA), DPR issued El Sur Ranch use permits for the drilling and operation of the wells within the land the ranch had donated to Andrew Molera State Park. The 1990 SWRCB staff determination that the El Sur Ranch wells were pumping “subterranean streamflow" necessarily means that the wells serving the former U.S. Naval Facility were also diverting “subterranean streamflow" without a water right. For many years after this determination, until at least 2005, the U.S. Navy, and then DPR, continued to pump water from these wells, but without obtaining either a permit or the interim approval of the SWRCB. The ranch's wells were all approved by DPR, both by use permits and by the terms of deeds accepted by DPR. This means that when DPR filed a complaint with the SWRCB about the El Sur Ranch wells in 1990, it was complaining about the same wells it specifically authorized fifteen years earlier. The water diverted by El Sur Ranch wells is from the underground flow in the last 2000 feet of the river system before it empties into the ocean. This area is the last opportunity to capture water for beneficial use and is the best location for the environmental protection of the river. El Sur Ranch pumping has not and cannot cause long-term aquifer depletion. This is impossible in the Big Sur River because, based on a 2004 water balance study, El Sur Ranch pumps less that 1/1000th of the average flow of the lower Big Sur River. This massive amount of annual watershed replenishment relative to the pumping volume precludes any possibility of harmful overdraft of the Big Sur River aquifer. At no time since El Sur Ranch has been using water have there been known instances of fish kills or harm to local fisheries in the Big Sur River attributable to water use or any other El Sur Ranch operation. The National Marine Fisheries Service website reports that the steelhead populations along the Big Sur Coast have retained near historic numbers. Recently completed three-year studies near El Sur Ranch have shown that the river continues to provide good habitat for the steelhead fishery. From 2004 to 2007, which includes a "critically dry" year, a "dry" and a "normal" year, fishery studies indicate a stable fish population. In 2004, a "dry" year, there were 358 steelhead and in 2007, a "critically dry" year, there were 380 steelhead. In a "normal" year, the count was 417. A very recent California Department of Fish and Game Fish Bulletin reports that "Recent studies of juvenile steelhead habitat use in the lower Big Sur River shows that the entire area, from the lagoon to the gorge, remains highly functional for steelhead production [R.G. Titus, CDFG]." … "Overall, the Big Sur River continues to support a healthy steelhead population, one that Nehlsen et al. (1991) classified as a stock of special concern." Titus, R.G., D. C. Erman, and W. M. Snider. History and status of steelhead in California coastal drainages south of San Francisco. In preparation as of January 5, 2011. El Sur Ranch has proposed a science-based river management, pumping and flow enhancement program that will support the ecosystem of the Big Sur River and allow cattle grazing to continue in Big Sur. The proposal would provide the steelhead fishery with more streamflow and habitats in times when water levels are low - up to 20 to 30 percent more streamflow than occurs when there is no ranch pumping. It would also improve the complexity of the riparian corridor in the lower Big Sur, thereby increasing useful habitat for steelhead. In addition, El Sur Ranch has offered to operate the flow enhancement program at its own cost, even when not pumping water, if it benefits the steelhead fishery. El Sur Ranch is also open to the idea of collaborating with the California Department of Fish and Game and local interests to open additional stream reaches for steelhead habitat, which will increase the size and range of the steelhead population without adversely affecting the residential and tourist uses of the Big Sur watershed. El Sur Ranch's pastures provide staging grounds for equipment and personnel during emergencies, which in the past have included wildfires and other weather-related disasters. 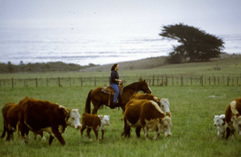 Offering a unique combination of flat, open spaces; irrigated fields without dust problems; proximity to the parks; and a freshwater reclamation pond, the ranch provides a singular location to safely and efficiently launch disaster relief for the Big Sur area. A portion of the water El Sur Ranch pumps from the wells in contention is reclaimed in a reclamation pond from which helicopters draw water to dump on wildfires. Without this freshwater pond, the helicopters would draw water from the ocean, which would result in saltwater being dumped on inland habitats where salt pollutes, dehydrates and destroys vegetation. In addition to providing staging grounds for fire response, the ranch's pastureland provides helicopter-landing space for CALSTAR when medevac is needed for the remote Big Sur community. When there is flooding or highway closures due to landslides proximate to the ranch, e.g., 1998 El Nino, the ranch provides staging sites for landslide-recovery materials to be used for restoration of lands impacted by highway runoff and erosion. 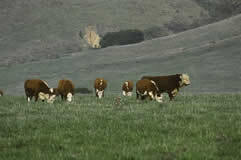 Without the irrigated grasses, the pasture will be overrun by invasive species and brush, as has happened on the adjoining Andrew Molera State Park. Such conditions would prevent setting up fire camps and equipment on the ranchland, depriving the Big Sur community of physical and logistical support essential to firefighting. Moreover, such vegetation conditions themselves present a fuel-laden fire hazard.